President Jair Bolsonaro on Tuesday signed a decree making it easier for many Brazilians to own firearms, the first of many expected changes by the nascent administration to overhaul gun laws in the nation that leads the world in total homicides. 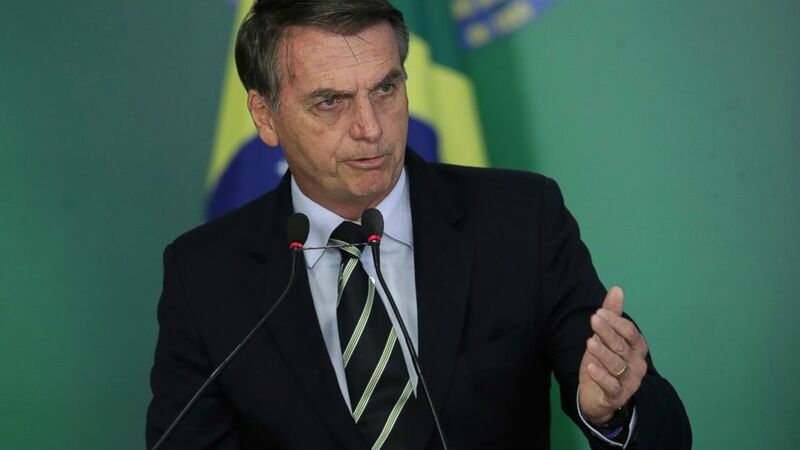 Bolsonaro signed the decree in a televised ceremony in the capital of Brasilia, arguing that it and other changes expected to be pushed in Congress would help people defend themselves. The former army captain and far-right leader, who won last year's election on promises to crack down on crime, said citizens in Latin America's biggest country have long made clear that they wanted to arm themselves. "The people decided in favor of buying guns and ammunition and we can't deny what the people wanted at that moment," Bolsonaro said, referring to a 2005 referendum in which Brazilians voted against banning the manufacturing and selling of guns. The decree established a wide range of categories for gun ownership qualification, and government officials said it was crafted to cover just about any citizen wanting a firearm. The decree also extended from five to 10 years the period to renew the registration of each firearm, and increased from two to four the number of guns each person can own. In one area that could be interpreted as tightening the law, it required gun owners have a safe with a key in any home with children, adolescents or a person with a mental disability. While the decree allows more people to buy weapons, it remains illegal for most civilians to carry them in public. Bolsonaro and the so-called "Bullet Caucus" in Congress plan a legislative push to overturn that. "If the Brazilian government is sincere about improving public security and fighting organized crime, it will enforce existing gun laws rather than dismantling them," said Igarape, a Brazilian think tank, in a statement. "Specifically, it should strengthen national data gathering on seized firearms to disrupt trafficking. It must improve oversight over the arms holdings of police and private security companies." "Any criminal in any part of the world fears an armed citizen," said chief of staff Onyx Lorenzoni minutes after the decree was signed. "England saw its home assaults increased by 40 percent since guns were banned there," he added, without providing more details. Polls have consistently shown most Brazilians want tighter restrictions on guns. A Datafolha poll published at the end of last year found that 61 percent believed firearms should be prohibited and posed a threat to others. The poll interviewed 2,077 people Dec. 18-19 and a had a margin of error of 2 percent. There were many signs Tuesday that fights over gun laws were just beginning. In an editorial titled "Reckless Decree," the newspaper O Globo criticized the changes for not being paired with better mechanisms to track guns. Many Bolsonaro supporters took to Twitter to laud the changes or argue, in angry language, that the decree didn't go far enough. Shares of gun manufacturer Taurus, which has enjoyed steady gains the last several months in anticipation of sweeping changes, closed 22 percent down. Many interpreted that as sign investors had expected Bolsonaro to go further, particularly in the number of guns each person can have. Proponents of loosened laws have long pushed for no limit. Meanwhile, Sou da Paz Institute, a rights group dedicated to violence reduction, launched an online campaign with ads blasting the government for its central argument for the change: that guns put people in a better position to protect themselves. "When you are sick, the government doesn't ask you to buy a scalpel and operate on yourself," said one of the ads. "If you're suffering because of crime, why do you have to protect yourself?"